Pathogenic mutations in the gene encoding TDP-43, TARDBP, have been reported in familial amyotrophic lateral sclerosis (FALS) and, more recently, in families with a heterogeneous clinical phenotype including both ALS and frontotemporal lobar degeneration (FTLD). In our previous study, sequencing analyses identified one variant in the 3′-untranslated region (3′-UTR) of the TARDBP gene in two affected members of one family with bvFTD and ALS and in one unrelated clinically assessed case of FALS. 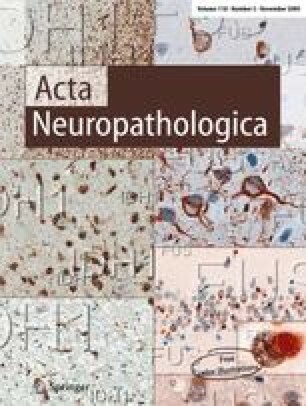 Since that study, brain tissue has become available and provides autopsy confirmation of FTLD-TDP in the proband and ALS in the brother of the bvFTD-ALS family and the neuropathology of those two cases is reported here. The 3′-UTR variant was not found in 982 control subjects (1,964 alleles). To determine the functional significance of this variant, we undertook quantitative gene expression analysis. Allele-specific amplification showed a significant increase of 22% (P < 0.05) in disease-specific allele expression with a twofold increase in total TARDBP mRNA. The segregation of this variant in a family with clinical bvFTD and ALS adds to the spectrum of clinical phenotypes previously associated with TARDBP variants. In summary, TARDBP variants may result in clinically and neuropathologically heterogeneous phenotypes linked by a common molecular pathology called TDP-43 proteinopathy. M.A. Gitcho and E.H. Bigio contributed equally to this work. Support for this work was provided by grants from the NIH (National Institute on Aging, P30-AG13854, E.H.B., N.J., S.W., M.M. ; P50-AG05681, P01-AG03991, U01-AG16976, P30-AG13854, and P30-NS057105, P50 AG16574; J.C.M., A.M.G., N.J.C., M.A.G., R.R. ), the Hope Center for Neurological Disorders, the Buchanan Fund, the Barnes-Jewish Hospital Foundation, the Pacific Alzheimer’s Disease Research Foundation (#C06-01) and the Charles Knight Fund. We thank the clinical, genetic, pathology, and technical staff of the collaborating centers for making information and DNA/tissue samples available for this study and we thank the families of patients whose generosity made this research possible.